With its still remaining historic districts, thousands of Buddhist temples, Shinto shrines and divine cuisine it’s a pleasure to explore Kyoto. The city is not too big (1,5 million residents) and surrounded by mountains. Easy to reach by public transport. A sophisticated, friendly breeze blows through. First thing I encountered, was the kamogawa Noryo yuka. 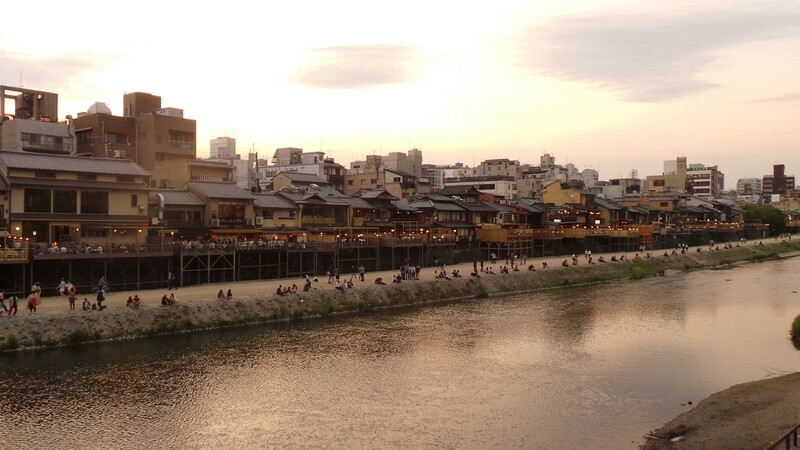 The riverside terraces with about 100 restaurants in the Shijo district will be put up from May 1st until September. Some of these restaurants have a typical ‘mysterious and secret’ atmosphere according to the blinds behind some restaurant windows. To visit the city it’s possible to go on the World Heritage Tour bus. I usually don’t prefer this type of transport myself but if you want to visit famous shrines and temples in a short time, it’s perfect. Taking the subway or public bus is also a convenient way to explore Kyoto. I’m very happy my lovely Japanese friend recommended me to buy a Suica card for public transport when I was in Tokyo. It’s not difficult to buy and use! 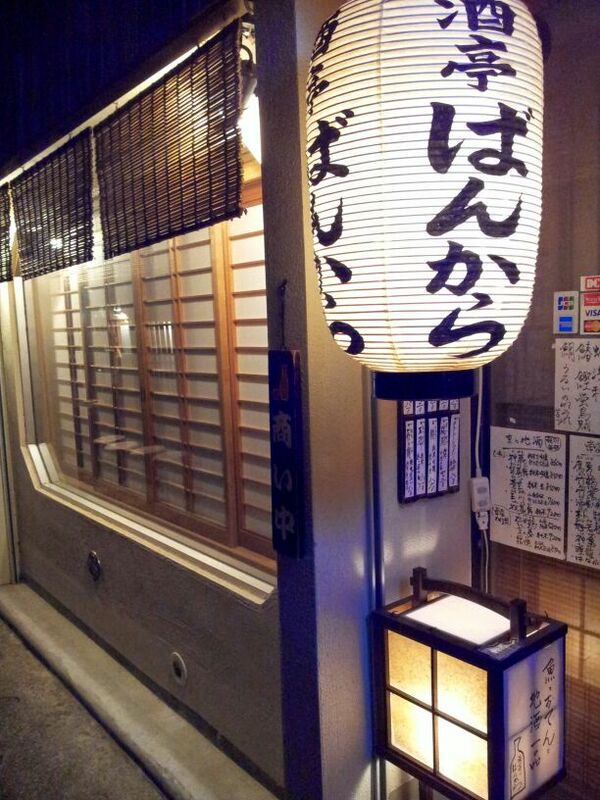 And it’s usable in Kyoto and in a lot of other places in Japan. 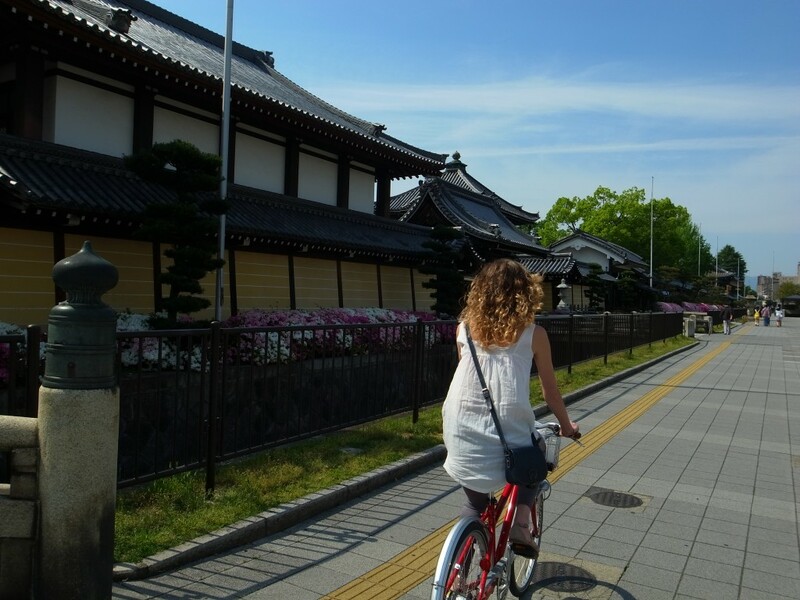 But my most favourite transportation in Kyoto is by far a rental bike. And just the old way, by foot. 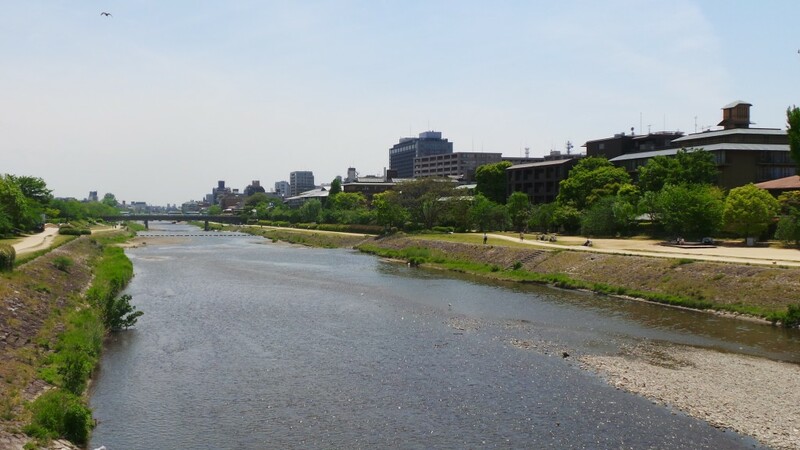 The moments I took a seat near the riverbanks, enjoyed a tasty bite and watched Japanese people, some foreigners and birds pass by, are memorable. These moments I digested the exciting events and dream about new to come. Yuki and I visited the Kiyomizudera temple (the clear water temple). Temples belong to buddhism. They store and display sacred Buddhist objects. The Kiyomizudera is famous for its large wooden veranda overlooking Kyoto. Not a single nail was used to build the main hall and veranda! The main hall houses the statue of Kannon Bodhisattva, the goddess of mercy. Which is famous for the power of answering prayers. 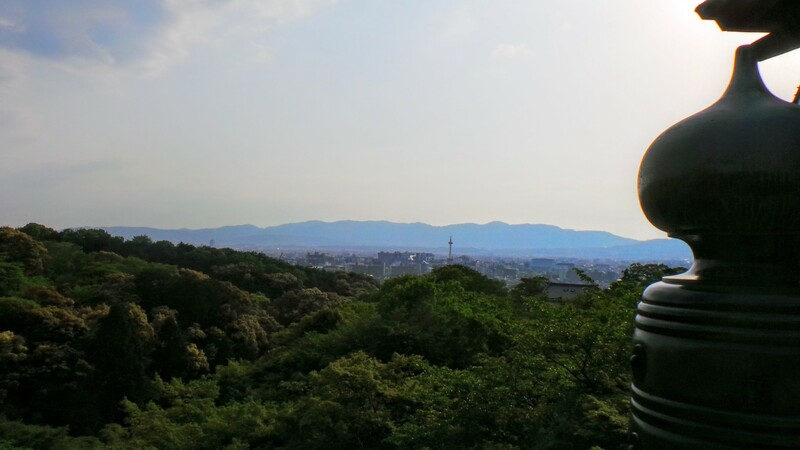 From the veranda we had a pleasant view over Kyoto. This is a good place to watch the sunset (when it’s not too crowded). The popular expression “to jump off the stage at Kiyomizu” is the Japanese equivalent of the English expression “to take the plunge”. This refers to an Edo period tradition that, if one were to survive a 13m jump from the stage, one’s wish would be granted. Two hundred thirty-four jumps were recorded in the Edo period and, of those, 85.4% survived. The practice is now prohibited (Wikipedia). By coincidence we found Jishu-jinja shrine on the same ground. Shrines belong to Shintoism. Each Shinto shrine is dedicated to specific kami (nature/spirits/gods). 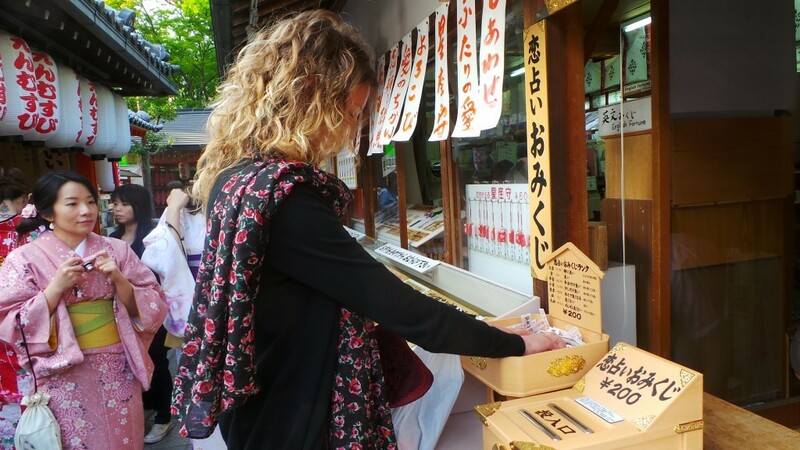 People visit shrines to pay respect to the kami or to pray for good fortune. In Japan it’s mostly during holidays and festivals that shrines become the popular destination. Other special occasions are a birth of a new born and weddings. Here the focus is on love and what’s in store romantically, but other life topics like health, birth and wealth are also involved. 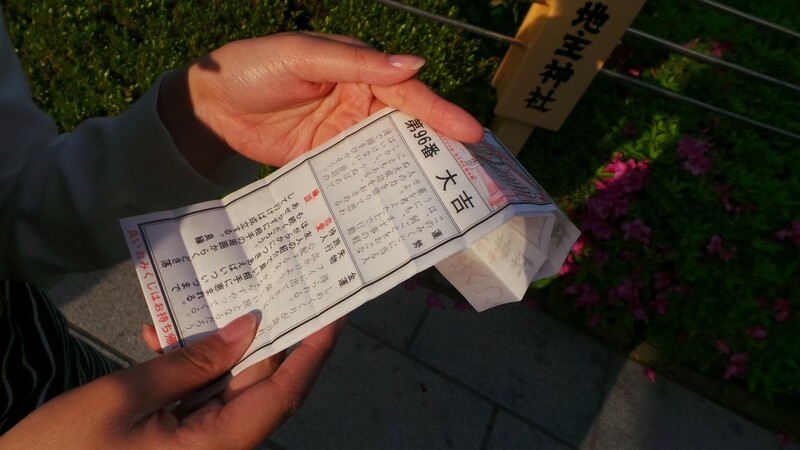 Those with good luck might fold them up and keep them in their purse or pocket as a treasured item. Those who are not so lucky will tie them up on the strings provided in the hope the kami will take care of it and free them for something better. And I picked the best one!! Number 96! And it’s still in my purse. The next feature we tried, were the famous love rocks. Successfully finding your way from one to the other with your eyes closed is said to bring luck in finding love. Should someone help you, by giving directions for instance, then you will find love but only through the help of another. I took the plunge with a little help! Curious how this love thing will turn out?